Andrew Cotter's day does not begin until he's had his "cup of Joe," a ritual he takes seriously as one of a growing group of coffee consumers who grind and brew specialty coffee beans at home for a more flavorful and fragrant experience. One morning, as the scent of freshly brewing coffee enveloped his kitchen, he wondered if storing roasted coffee beans in the freezer—a popular preservation method—was helpful in maintaining their aroma. As a food science major in Penn State's College of Agricultural Sciences, Cotter, who graduated in 2018, had a unique opportunity to investigate his pondering. "One of the great things about food science is that you have the opportunity to study food products that you enjoy yourself," said Cotter, whose research findings indicate that freezing does help preserve the aroma of certain varieties of beans. The results were published recently in the journal Beverages. "Like many people, I really love a good cup of coffee in the morning. With the rise in popularity of craft coffee, I wanted to do a project that will help coffee connoisseurs maintain the quality of coffee beans," he said. He found an enthusiastic supporter in Helene Hopfer, Rasmussen Career Development Professor in Food Science, who believed the research would yield insights that would be of value to consumers, especially those investing in "specialty" or gourmet coffee beans, which can cost more than traditional coffee due to careful selection of beans and small batch roasting. "When it comes to specialty coffee, there are lots of different opinions about how best to preserve the coffee," she said. "There are many who are against storing coffee beans in the freezer to avoid condensation, but looking into the scientific literature, Andrew could not find any evidence of that." 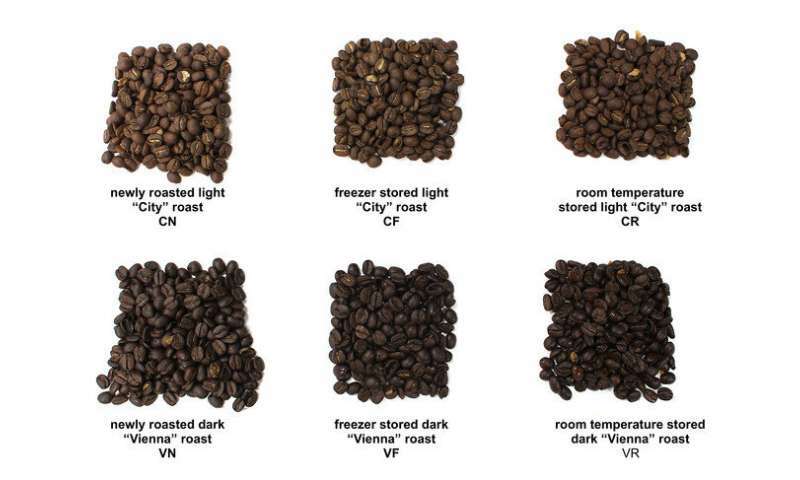 Under Hopfer's supervision and with support from Tiffany Murray, coordinator of the Penn State's Sensory Evaluation Center, Cotter in September 2017 began his two-part study, which began with a chemical analysis of six bean samples of roast levels from a light "City" roast to a dark "Vienna" roast. Using a testing procedure called headspace gas chromatography—mass spectroscopy, Cotter separated and identified the hundreds of volatile molecules in coffee beans. Through this process, he pinpointed the molecules responsible for aroma and measured the loss of those molecules based on roast level, storage time and storage temperature. After roasting the beans, Cotter stored half of the samples in the freezer and half at room temperature for nine weeks, a timeframe that Hopfer said was based on commercial practice. "Many coffee producers will package their coffee and ship it out, and then it may sit on the shelf in the grocery store for a couple weeks before being purchased," she said. "In that respect, nine weeks is not too extreme." Those stored beans—and another freshly roasted batch—were used for the sensory portion of the experiment, which was done at the Sensory Evaluation Center using projective mapping, a technique that explores similarities and differences among a set of products. 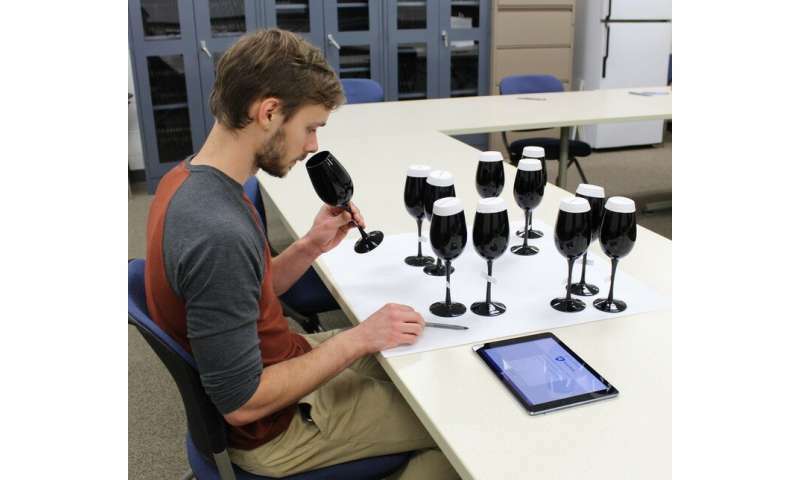 A group of 48 coffee consumers then was asked to smell the coffee grounds from the different roasts and storage treatments and arrange them on a large sheet of paper—placing similar-smelling grounds close to one another and dissimilar-smelling grounds farther apart—using descriptors such as appealing, unappealing, strong, burnt, dark, light, floral and roasted. What Cotter found was that for dark roast, most panelists noticed very little difference in aroma between frozen and fresh coffee beans. When it came to the room-temperature-stored dark roasts, however, participants placed those samples away from the others, indicating that it had a "different" aroma, Cotter said. As for the light roast samples, he said the panelists did not note substantial aroma differences among any of the samples, indicating that the light roasts lost less aroma over nine weeks than the dark roast. This trend also was reflected in the chemical analysis, he noted. "In short, the analysis showed that freezing coffee beans, especially dark roast varieties, helps to maintain the intensity and pleasantness of coffee aroma," said Cotter, who received an undergraduate research award from the college. Hopfer said she is impressed with how Cotter approached the project, saying, "Together we developed the research questions and how to best answer them, but he did all the work, from selecting the green beans to conducting trials," she said. "Andrew is a very thoughtful young researcher—he knows what he wants and develops a plan for how to get there." Cotter, who is now a graduate student at the University of California, Davis, said he is appreciative of the opportunities that were provided to him by Penn State and the Department of Food Science. "I came to Penn State with a surface-level appreciation for food products themselves, but I came out with a greater appreciation for all of the hard work that goes into making our food delicious, consistent and safe," he said. "Being in that atmosphere was incredibly important in helping me stay motivated and excited about what I was learning."